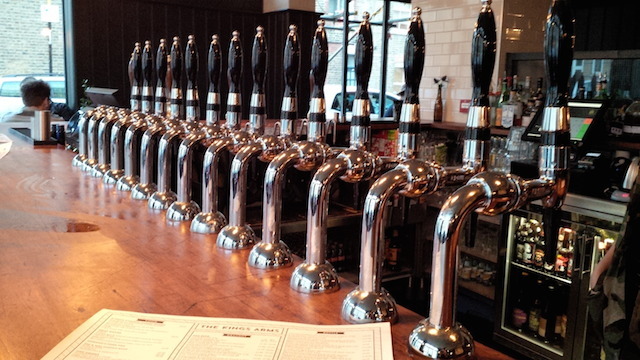 Welcome to A Beer Guide to London. It is "A" beer guide rather than "The" beer guide because it in no way intended to be comprehensive. It is a "curated" site -- which just means these are the pubs that a couple of beer geeks -- Fred and Jezza -- happen to like. Jezza lives in London and is the "boots on the ground" while Fred lives in Los Angeles and does the technical stuff (but he often visits London). We've designed the site with the beer tourist in mind, but it is also useful for locals who want to find the best beer and best pubs. Whether you are in London on a dedicated beer trip -- as London is now a beer destination worth visiting -- or you are in town for other reasons (business, family trip, etc.) and just want to try some good local beers, our pub guide will help you find the best places. You can browse our database of pubs by name or postcode district (e.g. "WC2") or geographical area or tube stop. Some recently published articles, or see them all here. Taken a London (or British) beer trip recently? Send us your trip report and we'll gladly publish it here. We've made the side more responsive so it should view fine on your phone or tablet. Or download the app from your favorite App Store for your smartphone or tablet. We're big fans of twitter and you can follow us at @BeerGuideLondon.